In just over 3 days, you helped us get halfway our $50,000 goal. Words cannot express our appreciation for this heartwarming and massive support. At the current backing pace, it’s quite hard not to start feeling confident that we will in fact reach our target. But, as you all know: with Kickstarter, it’s all or nothing. So we’re not popping any bottles yet. As you might have heard, next week is the first time we’ll be showing off some of our game’s demo levels to the world… So Excited! We’re going to Gamescom in Cologne/Germany. Maybe the largest game show in the World? We’ve been getting quite a lot of requests for a DRM-free (offline) version of Woolfe. At the moment we are using the Steam cloud and back-end for save-games, achievements and un-lockables. It will take some extra work to add these features to the DRM free version, but we figured it’s worth the effort. Also, we already got a mail from GOG that they would love to include Woolfe to their portfolio of games so how could we resist! So… DRM-FREE CONFIRMED ! WARNING: There is a cap… Kickstarter only allows a maximum of 10 items to be given per backer, so… if you back more, we’ll consider this a donation to the cause! We also have a small preview of some sticker tests for the $20/$25 pledge. In total we’ll have 5 different stickers in the package for you… more previews coming up! Also, feel free to tell your friends about Woolfe and our Kickstarter campaign: they might like to chip in too and help us make Woolfe as wonderful and entertaining as we possibly can. Let’s go for the HOME RUN!!! Thank you 40% in 2 days! OMG?! 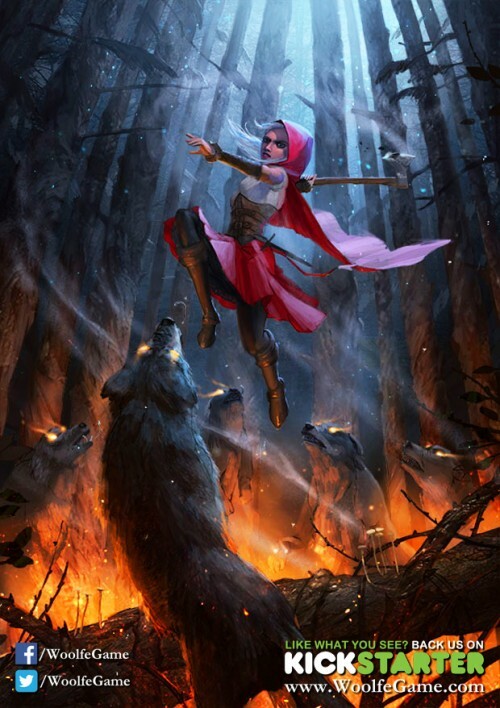 Looks like Red Riding Hood is going to have a hard time winning her battle and it’s all your fault In just over 2 days you and over 800 backers have enlisted in the Woolfe Army. This exceeds our wildest expectations and we can only say THANK YOU! We’re getting some great press attention from around the world. Here are a few links to articles that caught our eye. It’s not only these bigger media we want to thank. We have found numerous passionate gamers & cosplayers with their own underdog websites, facebook pages and youtube vlogs giving us so much love.Like you, we are also just a small team fighting for a big break… so gamers unite. YOU are our real world Woolfe Army! You might have noticed we’re quite hesitant about giving physical rewards at this point. There are some reasons for this. First of all, they seem quite a hassle for a small team like GRIN, taking up precious time we could use working on the game… that’s why the stickers and personalised proof of enlistment are currently our only physical rewards. They are easy to send by standard letter all over the world for a fixed price. Also we have to take into account that the money pledged for physical rewards can not go into development… so we could reach our goal without actually having enough reserves for development after subtraction of the physical costs. Now, our question to you… Is it ok for you that we add the Physical rewards as add-on’s after we reach our initial goal? That way we won’t jeopardise the magic feature or overall quality upgrade. Not over yet, we’re just beginning! 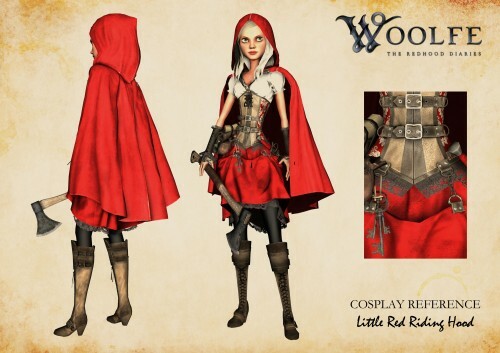 Find one game site/blog we’re not mentioned on… don’t spam them, but maybe send them a gentle reminder that you really like Woolfe and it would be really cool if they could help this ambitious indie title Woolfe – The Red Hood Diaries get a little more attention. For the past few months, we’ve been working like crazy. Last week, we took a little summer break and now it’s full speed ahead again. First off, we have some exciting news to share with you… (drumroll! ): Just minutes ago, we launched a Kickstarter Campaign! And of course we wanted you to be among the first to know about that. As you might recall from previous communications, we were granted funding to finish all three chapters of Woolfe: The Red Hood Diaries in their basic form. Meaning: we will be able to release the full game regardless what happens on Kickstarter, but…due to budget limitations we had to cut quite a few cool features. We’d love to get them back in there, which is why we turned to crowdfunding. MAGIC: Like any fairy tale, Woolfe still needs some magic… Magic powers to help our heroine overcome obstacles and opponents (invisibility, teleportation etc), and a shot of magic to inject into the environment and the story. 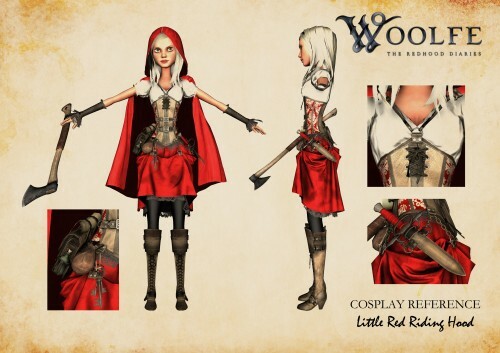 USER CREATED WOOLFE ARMY: We’re working on an online toy soldier editor, which will allow every single Kickstarter backer to create their own enemy, with specific looks and skills. 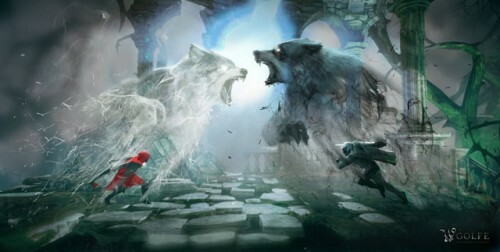 Fight your own customized opponent in the game as you step into the boots of Red Riding Hood. OVERALL QUALITY UPGRADE: There’s two things in particular we’d love to take to the next level: the combat, as it is not quite up to par with how we envision it could be. And the animations, for which we’d love to have a professional join our team. We hope you’ll consider supporting our Kickstarter campaign, be it by backing us or by spreading the word. We want to make this game as amazing as we envision it, but we really need your help to make that happen! Ready to Rock & Roll!!! We launch in less than 12 hours now! We launch in less than 19 hours now! 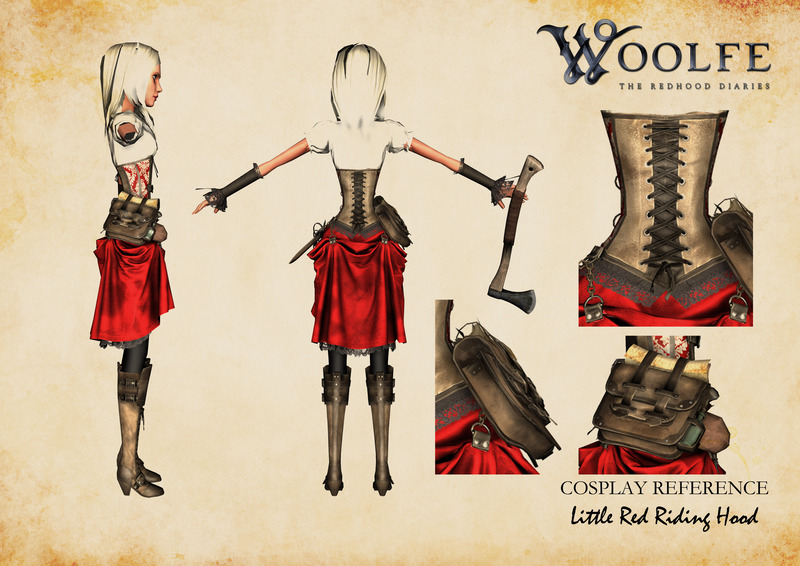 We found a way to give Woolfe a touch of magic! Since we got our loan to continue development, the last few months we’ve been creating levels, puzzles and boss-fights at a steady pace. The gameplay is really starting to take shape and we’re loving every minute of it! But as you know we had to make some compromises and cut some features, because even with the loan our budget is quite limited. One of the features we cut was: MAGIC. The more we are progressing with our development, the more we feel that every fairy tale needs a touch of magic. Imagine invisibility, teleportation and magical attacks. We’ve been looking for a way to integrate magic without compromising the overall quality of the game. Unfortunately, we have not found a way to do this without calling on you! So as many of you proposed on our Steam Greenlight Discussions, we’re turning to Kickstarter so that you can help us reach that next level. Today we are proud to announce that our Kickstarter campaign has been approved! We’re launching the campaign this Tuesday, 5th of August. Why not add something extra? 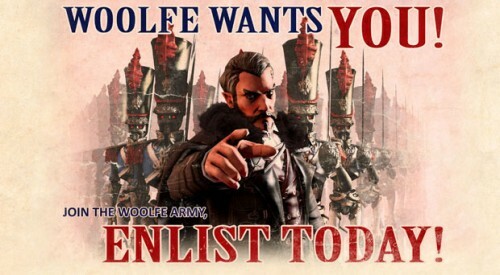 We want you to help us build the Woolfe army! As you’ve seen in our trailers, there are quite a few Toy Soldiers running around. At the moment, they are all quite generic, they all share the same characteristics and skills. We want to change that by giving every backer their own Toy Soldier to upgrade and improve. - YES, that’s the strange element. The cool thing is that every Toy Soldier will be unique and handmade by you, one of our backers! More information on which features/skill will be upgradable and how it will all work will be made available soon too. That’s it for now… We hope you like it. If you do, please help us spread the word! ps. Drop any questions, comments or suggestions here or on our Steam Kickstarter Discussion forum, this makes it easier for us to reply. As always we’ll try to answer as soon as we can! It’s confirmed: Woolfe – The Red Hood Diaries will be present at Gamescom Cologne (Germany) from the 14th to the 17th of August. This will be the first time anybody from outside Belgium will be able to play an early build of our game. We are so excited about this! You will be one of the first people in the world to try our game in development. And just to make things a little more interesting we are giving away limited edition Woolfe Gamescom prizes to top players! It might be a bit short notice, but if you decide to come as Red Riding Hood we’ll have something extra special for you too! Here are some reference pic’s to get you going… We’d love to see your making of pic’s too, so don’t forget to share them on our Facebook page. Woolfe actually got featured at the biggest game event of the year, by one of the biggest players in the world!